Cancer develops gradually as a result of many different factors related to lifestyle choices, environment and genetics. Anyone can develop cancer, but many cancers can be prevented. Personal behaviors such as tobacco use, alcohol use, poor diet, physical inactivity and overexposure to sunlight can increase the risk of developing certain cancers. Other influences such as viral infections and environmental exposures can also increase a person’s risk for cancer. Tobacco use is the number one cause of preventable death. People who use tobacco products or who are regularly around secondhand smoke are at greater risk for many different cancers. People who quit smoking, regardless of their age, experience major and immediate health benefits as well as significant gains in life expectancy compared to those who continue to smoke. Overweight and obesity are associated with an increased risk of developing many types of cancer. Lack of physical activity and poor nutrition are the main contributors to obesity. Approximately one-third of the cancers diagnosed in the U.S. are linked to these risk factors. Adopting or maintaining a healthy lifestyle before and after a cancer diagnosis can reduce morbidity and mortality from cancer and other chronic diseases. Regular oral health care can directly impact cancer prevention and control. Most oral cancers are related to tobacco and heavy alcohol use. Because some oral cancers can spread quickly, screening and early detection are important. Dentists and hygienists play a key role in the prevention and early identification of oral cancers by performing oral cancer exams, discussing the risks of tobacco and heavy alcohol use, and promoting cessation services. Human papillomavirus (HPV) is the most common sexually transmitted infection in the U.S. Many cancers in men and women can be caused by HPV. Cervical cancer is the most common HPV-associated cancer. Almost all cervical cancer is caused by HPV. Most HPV-caused cancers can be prevented by the HPV vaccine. The vaccine is recommended for adolescent boys and girls beginning at age 11 or 12 so they are protected before ever being exposed to the virus. To further reduce the burden of cervical cancer, women age 21 to 65 should be screened regularly to help prevent cervical cancer or detect cancers early. Factors in the environment can increase an individual’s risk of cancer. In addition to secondhand smoke: ultraviolet (UV) radiation, radon, arsenic and asbestos are all environmental factors known to increase cancer risk. Many other substances have been investigated as possible causes of cancer, but more research is needed to link exposure with cancer risk. The Vermont Environmental Public Health Tracking program links information on environmentally related diseases such as cancer through a web-based tool. Skin cancer is the most common form of cancer in Vermont and the U.S. Melanoma is the least common, but most serious form of skin cancer. Vermont has one of the highest rates of melanoma incidence in the U.S. Ultraviolet radiation exposure from the sun, sunlamps and tanning beds is the major known factor associated with melanoma. Melanoma is largely preventable through use of sun protection methods, such as sunscreen, hats, protective clothing, shade, and sunglasses. Vermont law prohibits the use of tanning devices such as sunlamps, tanning booths and beds by persons under 18 years of age. The law is intended to protect youth from exposure to ultraviolet (UV) rays, which can cause skin cancer, as well as to inform the public about the dangers of tanning. 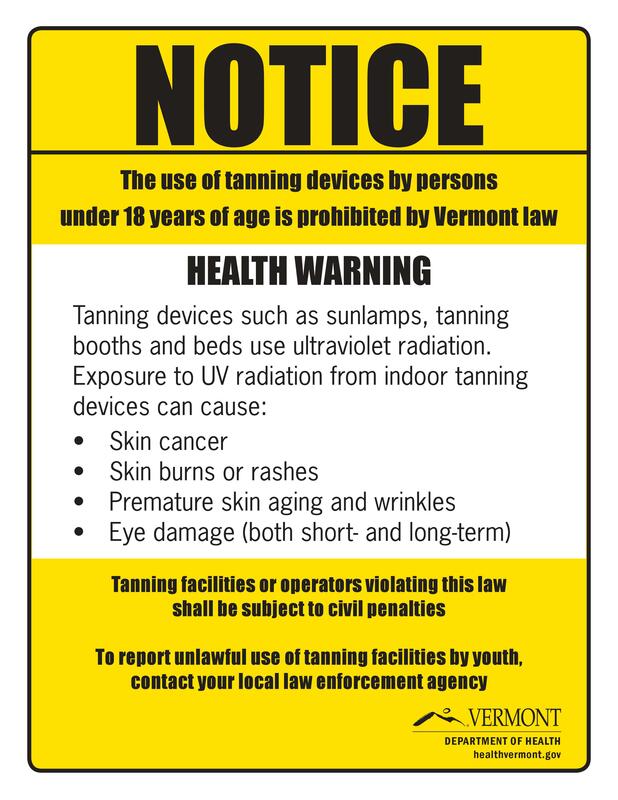 Tanning facilities in Vermont must post a notice to inform consumers about the age restrictions for using tanning devices, the health risks associated with tanning and the penalty and enforcement provisions under the law. Radon is a radioactive gas released from the normal decay of radioactive elements in rocks and soil that seep up through the ground and collect in homes and other buildings. Long-term exposure to radon can lead to lung cancer. Radon is the second leading cause of lung cancer in the U.S. after tobacco smoke. Elevated levels of radon have been found in all types of homes throughout Vermont. Under the federal Safe Drinking Water Act, all municipal and other public water supplies in Vermont must be tested regularly for bacteria, inorganic chemicals, naturally occurring radioactivity and naturally occurring compounds. Some of the contaminants regulated under the Act are known carcinogens. While community water systems are tested regularly, private water supplies are not. Homeowners of private water supplies are encouraged to perform regular water testing to ensure their water is safe. A comprehensive collection of health data is used to monitor cancer in Vermont. The Vermont Cancer Registry, a statewide cancer surveillance system, collects information on all cases of cancer diagnosed and treated in Vermont. Other sources of data, such as population health surveys and vital records are utilized to provide high-quality cancer reporting. These data help us more effectively work to reduce the burden of cancer in our state.